Springbank Whisky Distillery was officially established in 1828 on the previously illicit site of Archibald Mitchell, great-great grandfather of the present Chairman, Mr. Hedley Wright. 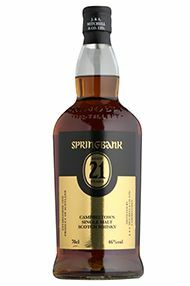 It is located in Campbeltown at the end of the Kintyre peninsula and produces three of only four surviving Campbeltown malts: Springbank, Longrow and Hazelburn. 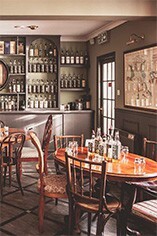 There will soon be a fifth when Kilkerran, produced at the recently opened Glengyle distillery, also owned by the Mitchell family, matures and becomes available. 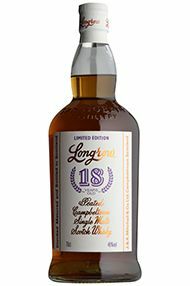 The Longrow, named after an old neighbouring distillery, closed since 1896 and whose last existing warehouse is home to Springbank's bottling plant. The malt is slowly dried for 48 hours above a peat fire giving the finished whisky a very pronounced peat character. Mitchells is one of the two signature blends of Springbank, the other being Campbeltown Loch. The high malt content creates a rich, premium blend, full of Campbeltown character. Springbank is unique amongst Scotland's distilleries in that it carries out the whole process of Whisky manufacture from floor malting to bottling at the one location in Campbeltown. Unlike any other single malt, Springbank is distilled two-and-a-half times from malted barley that has been lightly peated. 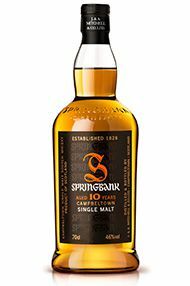 The 10 Year Old is the perfect introduction to the Springbank range. Whilst bourbon casks are mainly used for maturation, allowing the distillery character to shine through, a number of sherry casks are also used for added body. The light colour of this malt belies the richness of its character. Whilst the nose suggests a wide range of aromas, from citrus fruits to pears and a hint of peat, the palate excites even further with a touch of smoke, vanilla essence, nutmeg, cinnamon and the salty tang we have come to expect from Springbank. Complexity is the key word here yet it remains perfectly balanced from first sip to the full, rich finish. As the eye takes in the dark, russet colour of the 15 Year Old, the nose anticipates the rich sweet smell of the sherry casks used to mature this old style Springbank. The anticipation is rewarded as you pull the stopper and the sherry aromas drift out. 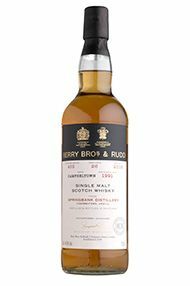 However, the sweet nose on this dram only begins to suggest the full range of flavours which emerge on the palate; dark chocolate, figs, marzipan, brazil nuts and vanilla all mingle to dramatic effect. A truly classic Springbank that is perhaps best enjoyed after-dinner.